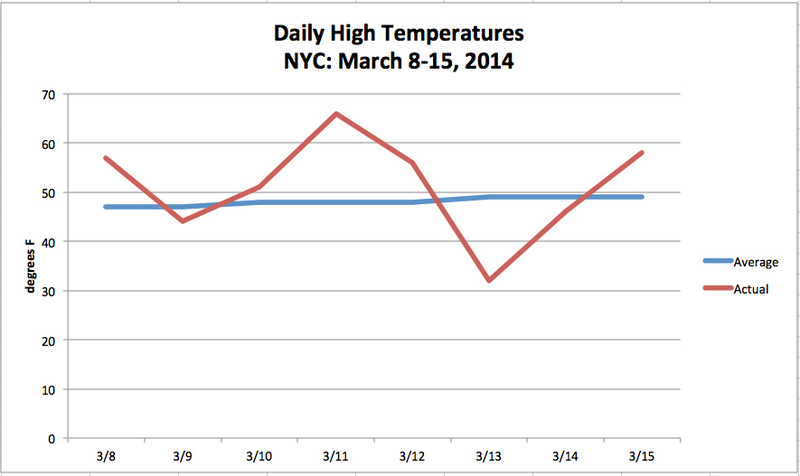 Up and down and back again, this was a volatile week for temperatures in New York City. Overall, it felt like we were on a weather roller-coaster. On Tuesday, the high temperature in Central Park was a balmy 66°F – the city’s warmest day of the year so far. Two days later, we were reminded that it is still winter when the mercury only made it to 32°F. Today, the temperature rebounded to 58°F, but it is forecast to tumble into the mid-30s again tomorrow. Our normal high for this time of year is 49°F. As jarring as they may be, these large temperature swings are par for the course in March. Transitioning from winter to spring, warm air in the south is expanding quickly while cold air lingers in the north. As a result, temperature gradients can be very tight and local conditions can change abruptly. This entry was posted in weather and tagged nyc, spring, temperature, winter by Melissa Fleming. Bookmark the permalink.